A Doncaster man who attends our day hospice in Doncaster has found an unusual way to express his artistic talents by using his mouth to paint pic-tures. Philip Hood, aged 30 from Wheatley in Doncaster, has been living with a neurological condition for over 12 years which causes muscle weakness and the inability to coordinate his arms. Philip has been attending St John’s Hospice for complementary therapies, art and crafts to help with his condition. Philip started attending the day hospice one day a month in Balby. 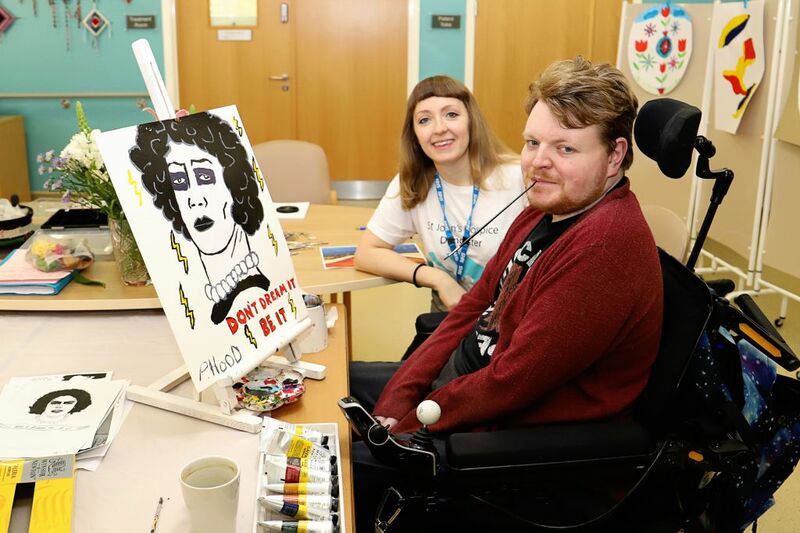 He began to regain his confidence after working with the Day Hospice Art Therapist Rachel Horne. Philip, who now paints every week and has inspired many other people around him to try something new, is hoping to hold an exhibition for his art work to help motivate others. The hospice is run by Rotherham Doncaster and South Humber NHS Foundation Trust (RDaSH). Philip Hood is pictured with his painting and Hospice Art Therapist Rachel Horne.